Holetown, St. James Sept. 30, 2014 – West Coast Villas Sotheby’s International Realty, a luxury real estate firm based in Holetown, St. James, Barbados, recently participated in the 2014 Sotheby’s International Realty® Global Networking Event, which brought together approximately 1,500 network members from 31 countries and territories worldwide. 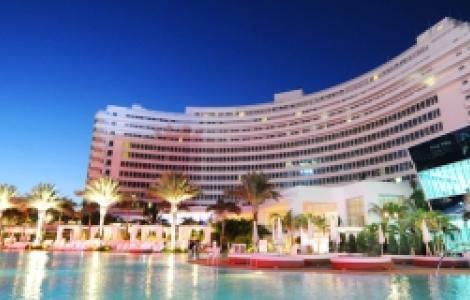 This dynamic, three-day event, which was held Sept. 8 to 10 at the Fontainebleau Miami Beach in Florida, provided a unique opportunity for Sotheby’s International Realty professionals to network and share best practices with their colleagues from all over the world. West Coast Villas Sotheby’s International Realty, which has offices in St. James and St. Michael, offers exclusive Sotheby’s International Realty marketing, advertising and referral services designed to attract well-qualified buyers to the firm’s property listings. In addition, the firm and its clients benefit from an association with the Sotheby’s auction house, which promotes real estate referral opportunities with auction house clientele. West Coast Villas Sotheby’s International Realty is located at The Beach House, Sunset Crest, St. James. For additional information, please contact 1 246 432-5050. The Sotheby’s International Realty network currently has more than 15,000 independent sales associates located in approximately 720 offices in 52 countries and territories worldwide. Each office is independently owned and operated.